Eight years old Charlie-Marie has to wear glasses, but she doesn't want to. She understands she will see better with her glasses, and that her eyes would only get worse if she doesn't use them, but she can't stop thinking nobody at school wears glasses. 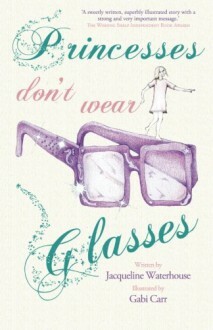 And even worst, princesses don't wear glasses! Then Charlie-Marie is visited by Jamey, a little fairy from the Land of Beauty, and a fantastic trip begins. Jamey leads Charlie-Marie to the Land of Beauty so she can discover Princesses do wear glasses. She specially asks Charlie-Marie to wear her glasses during their trip, so she doesn't miss any of all the incredible things out there. At the end of this adventure, Charlie-Marie meets Princess Spectacle, the most beautiful princess, with the most beautiful sparkling dress, wearing the most beautiful pair of glasses. This story won't work for every girl, since it is addressed to girls who are interested in princesses. But if the girl you are thinking in reading this loves princesses and would like to be like one, then she probably would feel bad about having to wear glasses, because it's true, princesses in movies don't wear glasses. I think Charlie-Marie's fantastic adventure would be helpful to ease the experience of starting wearing glasses. Wow! Great book for girls who hesitate to wear glasses.